2017 Wheels and Heels Against MS Walk! 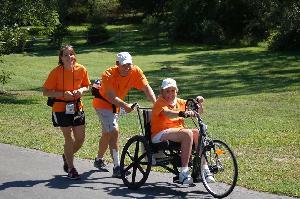 As we hit the mid-point of summer, the MS Challenge Walk is fast approaching. Anne and I are officially signed up and ready to take on another 50 miles in our continuing fight to stamp out Multiple Sclerosis. On September 8th, we will team up again (our 12th year together as team Wheels and Heels – my 15th overall) for our three day journey. Each year comes with its unique challenges, whether they be physical hurdles or just overcoming the heat, humidity or, one year, even a tropical storm. Although the challenges vary, what remains the same is our steadfast determination to celebrate that day when MS is nothing but a memory. Multiple Sclerosis is a frightening disease that affects the central nervous system. The symptoms may be mild (such as numbness in the limbs) or severe enough to cause blindness or paralysis. The severity and specifics of the symptoms of MS can’t yet be predicted, but advances in research and treatment are giving hope to all affected by the disease. This year Anne shared with me one such exciting treatment. There is a brand new drug out called Ocrevus that she has just been cleared to begin. This drug is the first of its kind that can dramatically slow the progression of MS in patients who have been diagnosed as Primary Progressive. Although the drug is not a cure, it’s slowing of the disease not only gives one more control over their current symptoms but also allows that precious time to wait out the more advanced and reversing treatments that are now in the pipeline. Your donations to the National MS Society are the key to these exciting treatments. We hope that you can continue to be a beacon of hope for all who battle this disease. No donation is too small! · You can also mail a check, making it out to The National MS Society.